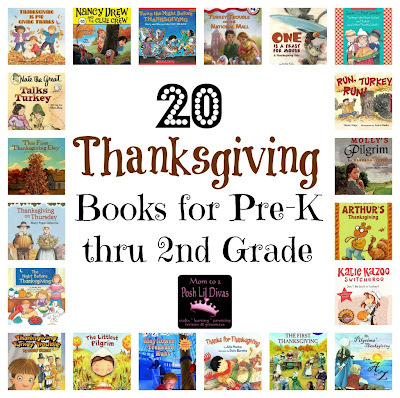 Looking for some fun Thanksgiving themed books to read with your kids and/or students? Here are some of our favorites ranging from picture books for the Preschool level to chapter books for 1st/2nd Grade. Thanksgiving is for Giving Thanks - Colorful illustrations capture what children are thankful for during Thanksgiving. The Night Before Thanksgiving - love this Thanksgiving take on the Night Before Christmas! We read it every year. Thanks for Thanksgiving - fun illustrations and more thankfulness for kids. The Littlest Pilgrim - the littlest pilgrim, Mini, wants to help but everyone seems to think she is too small. I love this sweet little book. Twas the Night Before Thanksgiving - after discovering that the farmer plans to kill the turkeys for Thanksgiving - the kids opt to try to smuggle them to safety. Their plan is foiled but the turkeys are saved! Kids always love this book - the page where all the children have the turkeys hidden gets lots of giggles. This First Thanksgiving - count along with all the pilgrim and native american children as they prep for Thanksgiving. Run Turkey, Run! - Kids always enjoy the antics of a turkey trying to hide from a farmer in this story. One is a Feast for a Mouse: A Thanksgiving Tale - This is a cute tale of a mouse whose Thanksgiving feast are all the leftovers from a family's feast. Kids always love the cute little mouse and his balancing act while collecting his food. Arthur's Thanksgiving - Arthur is directing the school Thanksgiving play but no one wants to play the poor turkey. Of course, he has to come to the rescue. The Pilgrim's Thanksgiving from A to Z - a great book with colorful illustrations to help kids learn more about Thanksgiving from A to Z (great to sneak in a review of letters too!). Thanksgiving on Thursday (Magic Tree House #27) - join Jack and Annie as the Magic Tree House whisks them back in time to 1621 and the First Thanksgiving Day. They learn first hand how hard it was to be a Pilgrim, meet Squanto and other Pilgrims, experience how grateful everyone was to have survived a harsh winter and of course learn to be grateful themselves. Nate the Great Talks Turkey - There's a turkey on the loose. Though Nate doesn't want to get involved, he gets pulled in as his dog Sludge, his cousin Olivia and the entire town search for the elusive turkey. Thanksgiving Thief (Nancy Drew and the Clue Crew #16) - Nancy, Bess and George are prepping for a Thanksgiving pageant when Thanksgiving food starts to disappear. The girls have to work together to figure out what is going on and save Thanksgiving. Turkey Trouble on the National Mall (Capital Mysteries #14) - KC and Marshall don't think pardoning 1 turkey is enough so the night before Thanksgiving they gather lots of turkeys on the National Mall to be spared only to find them missing the next day. Junie B. First Grader - Turkeys We Have Loved and Eaten - Junie B. is always a welcome read for the 1st & 2nd grade set, especially the girls. In this book Junie B. is in a contest for which room can write the best thankful list. What the kids are thankful for is sure to elicit lots of giggles. Thanksgiving Turkey Trouble - (Ready, Freddy! # 15) - Freddy gets the unlucky role of the turkey in the annual Thanksgiving play at school. A to Z Mysteries - Mayflower Treasure Hunt - While spending Thanksgiving in Plymouth, Massachusetts Dink, Josh and Ruth Rose hunt for a sapphire necklace that went missing on the real Mayflower. The First Thanksgiving - a basic exploration into the first Thanksgiving which kids will be able to read independently. Molly's Pilgrim - Molly isn't your typical Pilgrim, she is a young Jewish immigrant from Russia who came to America in search of religious freedom. Be ready for lots of emotion reading this one! Molly tugs at your heart strings. Don't Be Such a Turkey - Katie Kazoo Switcheroo - 2 adventures in one book. The first has Katie experiencing life as a 17th century pilgrim. The second puts Katie in the Thanksgiving Day Parade! What a great collection! I wish I could just spend my days reading.